House of Dementia is the southern wing of the New Sheoth Palace, and the seat of power for the dukedom of Dementia. The wing consists of three different areas: the House of Dementia proper, the Duchess' Quarters and the Private Gardens. The main chamber of the House is a is an oval-shaped room with an extremely high ceiling and grand architecture designed to exemplify the Duchess' power. The whole room is covered with tapestries and carpets in the color scheme of Dementia and Dark Seducers guard the entrances. Duchess Syl holds court in the eastern end of the chamber, where her majestic throne and her advisers' chairs can be found. Doors from here lead to the Palace of Sheogorath, the Palace grounds, the Private Gardens. The corridor departing from the southern side of the chamber leads to a secondary entrance to the Gardens, the private quarters of the House's servants and the torture chamber. Next to the double bed where Anya Herrick and Kithlan sleep are two bedside tables: on one rest two lockpicks and a skull, on the other a bottle of Fellmoor swamp wine and a sack with some gold. The northern area holds some storage, a stock of cheap wine and a clothing cupboard with a small chance of finding an oddity. Atop it are two more bottles of Fellmoor swamp wine, a hound tooth, a sample of void essence, a blister pod cap and worm's head cap. In the southern section is an alchemy table, a shrine to Sheogorath and a red finery laying atop a chest. The two chests in the room contain excellent leveled loot, while all the others only contain the usual food and clutter, although the barrel in the southeast corner may contain some rare ingredients. The torture chambers are located further to the south, and are inhabited by Herdir. There is plenty of blood spattered on the floor, and an intimidating cage flanked by two hunger statues occupies the center of the room. On the sides are the cells occupied by Syl's prisoners. The Duchess' Quarters can only be accessed from the House by transiting through the Private Gardens; both the doors require the House of Dementia key. Entering is considered to be trespassing and will have to face off two hostile dark seducer royal guards. The quarters consist of two large, connected chambers. 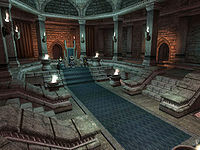 The first is quite bare, only containing a few statues and busts of Sheogorath. The second is decorated by various plants native to Dementia and is of more interest. Next to Syl's double bed is an urn which contains excellent leveled loot. To the left of the bed is a storage area with a few bottles of cheap wine, a collection of skulls placed atop a bookshelf, a table with two soul gems (greater and common) and a chest with more leveled loot. To the right is an alchemy table with an apprentice calcinator, an apprentice alembic, two samples of water root pod pit, four fungus stalks and a sample of rot scale. Both the chest and the urn nearby contain leveled loot. This page was last modified on 22 January 2018, at 15:19.